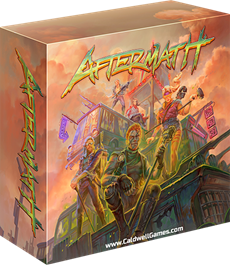 Announcing Aftermath - upcoming character building post-apocalyptic adventure board game for 1-5 players. It is set in the Waste, a post nuclear land steeped in radiation and full of danger, adventure and treasures to be found. This is where you intend to make a name for yourself. Your goal is to explore and survive the Waste, while becoming the most famous adventurer in the process! Aftermath is an adventure game, including 400 mini stories that can be experienced by adventurers of the Waste. Players initially build out their character through a draft, then continue to develop their character through Items, Consumables and Traits obtained during game play, as well as the Companion you choose to adventure with. Players can explore the world, salvage materials, build reputation with settlements, trade, craft Items, build buildings (for Fame and reputation) and complete Missions. Aftermath was designed to be easy to learn, yet still provide deep game play and a thematic story experience. Due to the variance in the cards, map tiles and dice rolls, each play through of Aftermath will provide a unique story experience specifically for the players at the table. No two stories will be alike!